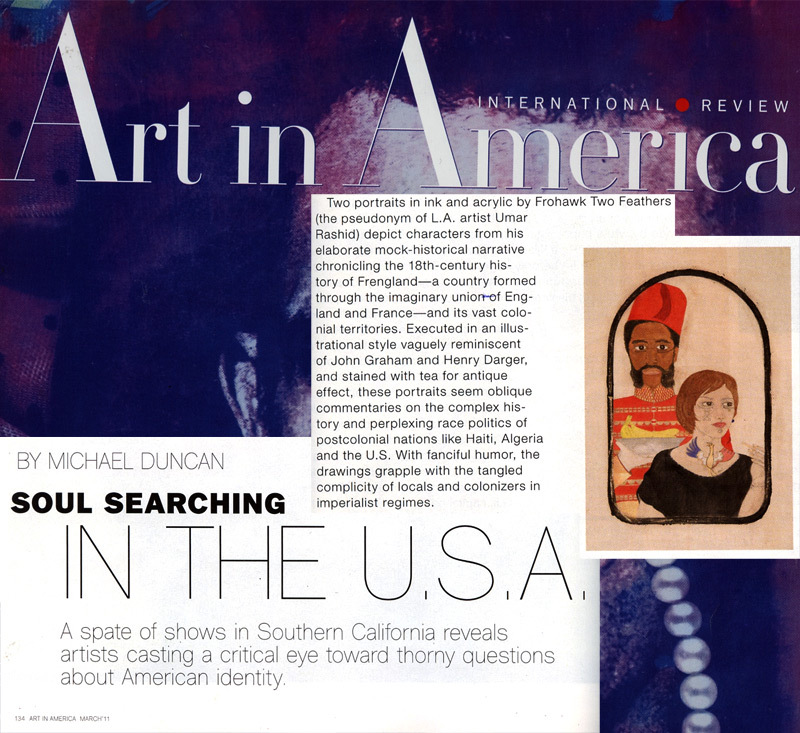 Soul Searching in the U.S.A. by Michael Duncan. March 2011. Taylor De Cordoba is pleased to present Crocodile Company, Part I. La Guerre Des Machettes Danseuses (The War of The Dancing Machetes), a new series of mixed media paintings and drawings by Los Angeles-based artist Frohawk Two Feathers. The exhibition will run from February 19 through March 26, 2011, with an opening reception for the artist on Saturday February 19 from 6-8pm. This is his third solo show with the gallery. Frohawk Two Feathers continues to demonstrate his skill as a master storyteller, spinning tales of colonialism, imperialism and conquest with his wholly unique iconography. Blending his obsession with the history of conflict and pop culture influences from video games, films and TV shows, the artist tells a wartime narrative starring an imagined cast of fascinating characters. 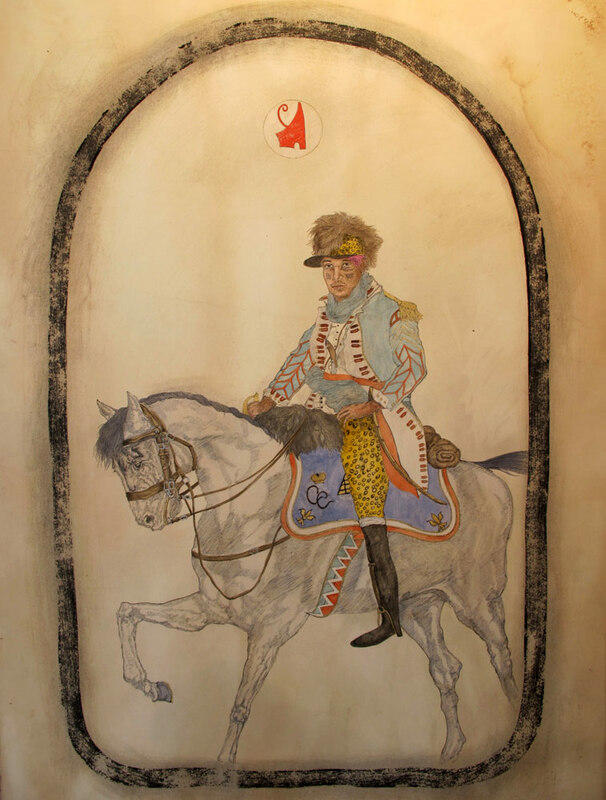 Using two classic traditions of both painting and map making, Two Feathers communicates a tragic, yet often humorous story that, through a slight of hand and bristle of the brush retell and reshape historical roles of race, class, and gender. Originally trained in photography, the artist uses elaborately staged photographs of friends and family as the source material for the final portraits on view. As with his previous bodies of work, each series functions as a chapter in a never-ending tome. Set in 1789 in the Caribbean, “The War of the Dancing Machetes” is a story of assassination, slavery and the fight for power. Deadly clashes between the black ruling class and “The Crocodile Company” (the newly propertied “mulatto” soldiers), drive this story. While these themes of unrest are familiar in art history, Two Feathers approaches his subjects with a keen eye, creating a unique and memorable visual language. And as a viewer immersed in his storytelling, one cannot help but question whether the specifics come from the artist’s mind or straight from the history books. The artist loosely based this series on the actual “War of Knives” that was fought as a precursor to Haitian independence. You are currently browsing the Taylor De Cordoba blog archives for March, 2011.